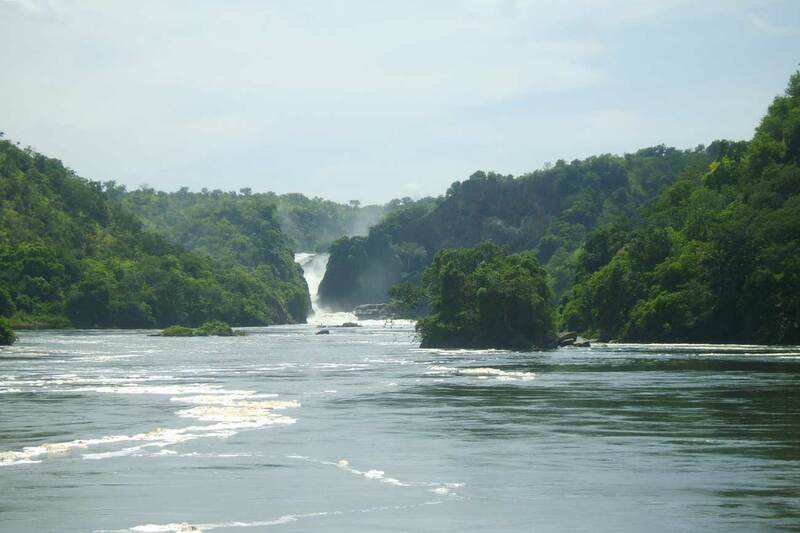 This is the largest of Uganda’s national parks and is characterised by the magnificent Victoria Nile as it plunges down 43m of the rift valley wall creating Murchison Falls. Dramatic views can be seen by boat from below and, after a short walk, from on top of the Falls. The Park is noted for being a location for The African Queen (1951). Kaniyo Pabidi Forest – an area in the south of the Park where you can enjoy forest walks and excellent birdwatching. There is also a habituated chimp group that you can track. Amazing views from the top of the falls – on alighting from the boat at the bottom of the falls, a 30-minute hike will take you to the top. Animals: elephant, buffalo, leopard, lion, giraffe, Jackson’s hartebeest, bushbuck, Uganda kob, olive baboon, patas monkey, black and white colobus, chimpanzee, warthog, crocodile and hippo. Birds: Shoebill Stork, the Goliath Heron, Grey Crowned Cranes, Blue-headed Coucal, Swamp Flycatcher, Squacco Heron, African Jacana, Sandpipers, Denham’s Bustard, Abyssinian Ground-Hornbill, Black-billed Barbet, Black-headed Gonolek, Eastern Grey Plantain-eater, Piapiac, Silverbird, Weaver Birds, Pied, Giant and Malachite Kingfishers, Red-throated Bee-eater, White-browed Sparrow-Weaver, Speckle-fronted Weaver and African Quail-Finch.